V marcu 2007 sem začel počasi opažat, da je nekaj narobe z mojim požiranjem. Ker nič ni bolelo in ker nikjer se nič ni poznalo, mi je bilo najtežje priznat ali je res nekaj narobe z mano ali je vse v glavi. Z zdravnico sva ugotovila, da moram na gastroskopijo, strah pred tem pregledom je čisto opravičen, meni je bilo zelo naporno. Zravnica(že zdavnaj za v penzijo) mi je rekla, naj po posegu pijem mrzlo vodo. Šele potem mi je omenila, da sem nekaj krvavel iz požiralnika(ma nemoj). Gastroskopija ne pokaže napačneha delovanja požiralnikaka, zato me je napotila k njenem kolegu kirurgu M.B. ki me je poslal na RTG požiralnika. Po RTG-ju je bilo jasno, da ne morem požirat in da sem zbolel za boeznijo ahalazija kardije, gre za to da zaklopka na vrhu želodca(kardia) se ne razširi ko ješ ampak, je skozi toga. Kirurg mi je priporočal laparaskopsko operacijo, saj naj bi bil dolgotrajen efekt, za razliko od pnevmatske dilatacije(balonček). Kirurg M.B. mi naroči naj jem en mesec pasirano hrano... Navodil sem se striktno držal na pregledu sem potrdil napredek pri pitju tekočin na kar me je naročil čez 3 mesece. Ko sem bil spet na pregledu ne bom pozabil začudenega pogleda kirurga "A ni vredu?" ja glede na to da sem shiral verjetno NI. Ugotovil sem, da sem bil prvi neuspeli pacient. Nato me je naročil takoj čez en teden na pnevmatsko dilatacijo v UKC LJ. Prvo zboliš za bolezen, ki jo ima en na 100.000 in po vrhu so še dohtarji neuspešni, brez veze. Zadnjič preden sem šel na zadnji poseg sem na TV zvedel, da je kirurg, ki mi je delal pnevmatsko dilatacijo, deklici 6x prebodel serce med operacijo iz malomarnosti, uboga je umrla njemu pa so odvzeli licenco za 4 mesece. Prvi kirurg je nekaj "zašuštrau" in potem se vprašam "Kam hudiča pa naj grem???" 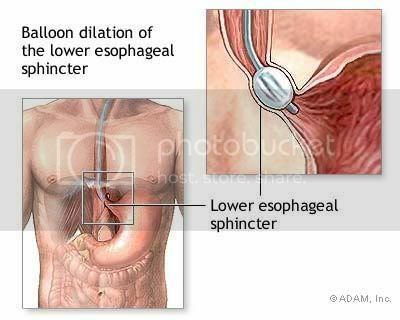 In March 2007 I noticed something was going wrong with my swallowing. Because it didn't hurt and nowhere wasn't nothing to see, it was hard for me to admit having a disease. After two moths I couldn't swallow normally any more. With every meal I had to drink a lot of water, every bite was a hard task. Sleeping was also a problem, because of the reflux. I slept in half-sitting position to prevent the reflux. Then I went to the doctor, she thought that I have reflux and she prescribed me anti-acid pills for two weeks. 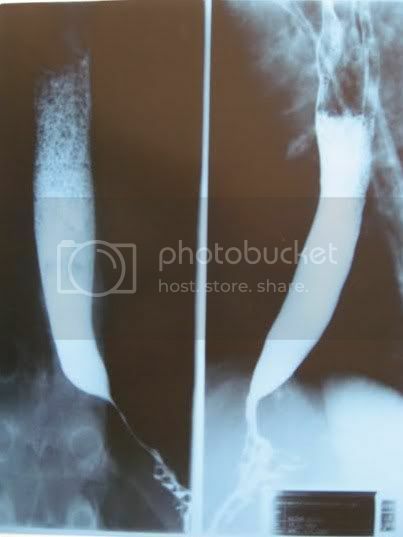 The gastroscopy didn't reveal any esophageal malfunctions, then they sent me to X-Ray scan of esophagus. The X-Ray revealed that I have a rare disease called achalasia cardiae. 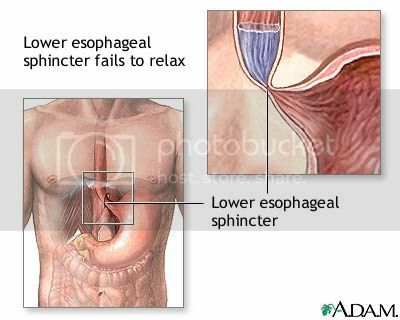 It is a malfunction of the valve at the lower end of the esophagus. The surgeon recommended me to have a laparoscopic surgery instead of the less invasive operation, balloon dilatation. In September I had the operations and if I'm honest I thought it should be nothing special but it turned out to be much more painful (I need 3 months for full recovery). 24 hours after the operation I had an X-Ray of my esophagus and instantly I was suspicious. The surgeon told me to eat only soft mixed food for one month. I followed his instructions (directives) and I confirmed that was a little improvement while drinking fluids. Then he told me to come after three weeks. In the next three weeks I loose additional 5 kilos from 67 kg to 62 kg. I'm 178 cm tall and with that weight I could easily do commercials for anti weight pills or cremes. I couldn't forget his look when I told him that I wasn't better. Considering that I was still losing weight it couldn't be better. Then I found out that the operation wasn't successful on me, I was the first patient went wrong. After this the doctor sent me on the light version operation, pneumatic dilatation. First you get a disease which affect one person per 100.000, and then you find out that doctors didn't fixed you correctly, boring. In a period ob two months I had the pneumatic dilatation twice and the last was good enough for a year. Then I had to have another time the operation, it was becoming almost a routine for me (if someone have the same problems, I recommend to take some anti-acid pills, it really reduces the pain after the operation). In the last two years I was four times narcotized, I totally get used to the feeling of narcosis. At the first you feel some tingling in the body and then you fall asleep as a baby. Before it you just hope to get awake after the operation is complete. Last time while watching TV, I saw the doctor who performed the pneumatic dilatation on me, he was negligent and pierced 6 times the heart of a girl, soon after she died. After fact the license was taken from him for four months. OK, the first doctor didn't fix me well and the other is negligent, where to go? Now I'm in a full condition with my 178 cm / 72 kg, my only complains are I haven't enough muscles for lumberjack-in. If I get worse I'm going to ask doctors just to mount me an INOX pipe φ20. This is my experience with this devil, if someone have the same trouble, just write to me. ma zdej je vredu s tem? upam,da ja. Zdaj sem vredu, I'm getting fat :P and I like it. Sem ti poslala sporocilo ma tvoj mail.